Turkmenistan's free petrol supplies for car owners will be discontinued, although citizens will apparently keep receiving gas, electricity, water and salt free of charge. From 1 July, Turkmens will no longer get their monthly allowance of 120 litres of free petrol, state TV reports. Gurbanguly Berdimuhamedov, leader of the Central Asian republic, says the change is being made to "ensure the sustainable development of the national economy, as well as the rational use and distribution of fuels". The free petrol allowance was introduced by the president in 2008. Under his predecessor, the eccentric long-time ruler Saparmyrat Niyazov, petrol was not exactly expensive either at 0.05 manat ($0.02) per litre. 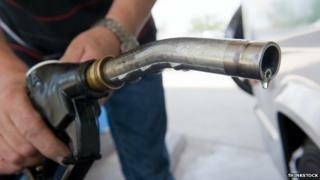 But after the authorities started handing out free petrol to car and motorbike owners, they also raised prices at petrol stations to almost $0.22 a litre, diaspora website Khronika Turkmenistana reports. Turkmenistan says it has the world's fifth largest estimated reserves of natural gas, and also sizeable oil deposits. But it says has been unable to exploit them fully because the country lacks viable export routes, and there is a dispute between the Caspian Sea littoral states over the legal status of offshore oil.